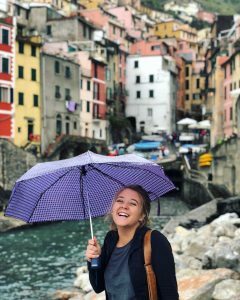 We caught up with SAI Ambassador Katie, who reflects on her semester in Florence and her fun weekend travels. What travel tips would you give to someone studying abroad? Laugh it off when something goes wrong. It is inevitable that at some point something will go astray. It is so easy to get caught up in the ideal and how things “should have” gone. There are times where it will seem that only your train is running late, google maps will stop working right when you need it most, all of a sudden getting lost in beautiful scenery doesn’t seem like a perfect Pinterest quote, and the ins/outs of traveling can become incredibly overwhelming. Try your best to enjoy all of the experience. Time will pass eventually and it will somehow get worked out in one way or another. Traveling is a process. It is the whole process in which you can learn and experience from, not just the aspect of getting from one place to another. The sooner you realize that you have control over how you react to the different situations, the quicker you will find that you then have the power to shape the whole experience. I was known for my horrible sense of direction and lack of understanding of why maps never seemed to work for me when I first got to my host city – so much so that I had my roommate walk me to class on my first day of classes. Or the countless amount of times I found myself in a downpour of rain without an umbrella. But as often as I got lost or it seemed that everything was going wrong when traveling from one city to another, I can look back and know that I made the best of it. Some of my greatest friends from my time abroad came from the fact that I was the girl who walked in late to the cooking class or that the thirty-minute train trip turned three hours led me to the best concert yet. Try to give yourself enough time to get places, don’t be afraid to ask for help, remember to drink water, always pack snacks and double check that you have that umbrella – but most importantly, don’t stress the little things. Part of the journey of traveling is learning to go with the flow and be in the moment, not the ideal. So make the most of whatever life is throwing you that day and take in the experience of the moment. Cinque Terre in the rain wasn’t exactly what I had planned but it is still one of my favorite memories abroad. Studying abroad has already opened up new doors and possibilities regarding career goals. In my decision to study abroad, my main goal and mindset was centered around the purpose of growing as a person. I intended to break out of my comfort zone and branch out. I had the chance to tune into what factors are important to me to live a life I love and a chance to develop life-enhancing skills. My study abroad experience has taught me more about myself and the world around me than I ever could have imagined. I’ve gain friendships with locals, an Italian family and Americans from all various states. While living in Florence, I learned how to adapt to various surroundings and consistency changing environments. Studying abroad strengthened my confidence, independence and self-sufficiency. It was due to this renewed sense of self and positive attitude that I found myself at an audition for Disneyland Paris in Rome. Immediately following my semester’s final exams, I packed up my bags and had the chance of a lifetime to fulfill a dream of working for Disney, and in Paris, France! The personal growth I had undergone while studying in Florence quickly carried over to assist me in my transition to my new position. I felt capable taking the initiative, navigating uncertainty and change, and being curious and open-minded about the French culture. Working in Disneyland Paris would have not been possible if I had not chosen to study abroad in the first place. 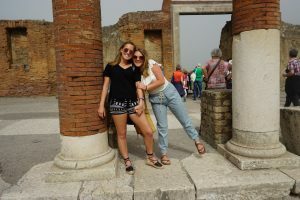 Studying abroad certainly shaped my future career goals in terms of applicable experience, especially in the arena of effectively communicating with people from all different walks of life. Going forward, I am now open to potential opportunities that would allow for me to continue my love of travel and relationship-building skills to work that I had not considered before my time abroad. Studying abroad taught me through hands-on experience the endless amount of possibilities to utilize the skills learned and the various job markets in the international field. 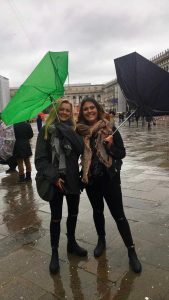 Just a tad bit of wind and rain on our Venice trip… still all smiles though with the roomies! Florence offers individuals an abundance of heart and soul in every direction. From the famous museums, delicious food and hidden gems tucked away in each corner there truly is something for everyone. Studying abroad is such a unique opportunity in the sense that you get to not just visit but live in a foreign city. I fell in love with Florence the moment my taxi driver quickly dropped me off in front of my apartment and at, what seemed at the time, right in the humming chaos of the city center. 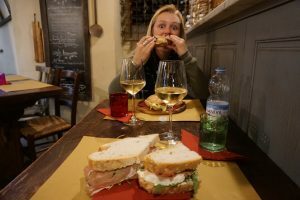 Although I was thoroughly eager to see all the sights and try as many gelato flavors, I began to notice that how I wanted to spend my time was different than I originally planned. Simply exploring the city brought me peace of mind and happiness. I loved the freedom of walking to my destination and embraced each step as a further opportunity to experience Florence. To leave my door and wander to new findings or stroll down my favorite streets opened up a sense of belonging to my host city. I felt I was able to learn not only about how to navigate the confusing streets but further understand the Italian culture. Florence is a beautiful city, filled with history and culture on every street. Through exploring I find stumbled upon hidden gems, beautiful music and felt connected to the city. To walk through the city is quite liberating and something very different than life back in the US where we often jump in our cars for one stop to another. Walking lets you be fully in the moment and breathe in the present. So often, especially as a college student, my mind was in a million different directions as I went from one task to another. The ability to explore by foot provided me the chance to emerge myself into my new home for the semester. Wherever you may study abroad, take the extra five minutes to stroll down a new street – you never know where it may lead you. Katie was an SAI Florence spring 2018 student from the University of Kentucky.